One of the most dominating media in Japanese traditional art production, woodblock printing was mostly used for the famous ukiyo-e artistic genre of single sheets, as well as for printing books. To be more accurate, woodblock printing was used in China throughout the centuries for book printing; however, it became widely practiced in Japan during the Edo period spanning from early 17th until mid-19th century. The Japanese water-based inks enabled a wide range of vibrant colors, glazes, and transparency, so artists were able to express themselves to the full extent and present the traditional iconography with great precision. One of the last representatives of the traditional Japanese woodcut was Tsukioka Yoshitoshi, saluted for his innovation and outstanding craftsmanship. His career was developed during the last years of the Edo period Japan, and the first years of the Meiji Restoration. In the last few years his life, Yoshitoshi struggled against the modern technology; the great master worked in the traditional manner, despite the fact Japan was taking over Western mass reproduction methods such as photography and lithography. 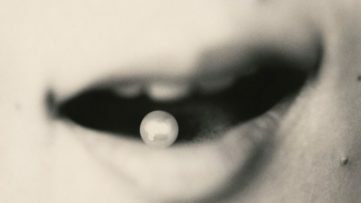 Nevertheless, the artist maintained, and even extended, this specific medium before it effectively died with him. The Philadelphia Museum of Art decided to release an extensive retrospective of Tsukioka Yoshitoshi under the title Spirit and Spectacle by interpreting his artistic practice accordingly to the context social and cultural shifts of his time – the collision of the artistic culture of feudal Japan and the new realities of the modern world. The upcoming exhibition will feature almost one hundred works drawn primarily from the museum, which holds the largest collection of the Yoshitoshi’s prints outside of his homeland. These prints will reveal a high level of imagination and inventiveness of the great master in regards to the Japanese social and political context, as well as all the other factors that shaped his oeuvre. In 1873, Yoshitoshi produced impressive designs for The Postal Newspaper which enabled him other commissions. The artist searched to find new ways to refresh the woodblock print, so he combined traditional subjects and styles with a more expressive approach reminiscent of the western perspective with energetic lines. This exhibition offers an opportunity to share a truly exceptional, but perhaps lesser-known aspect of our collection with the public. While Yoshitoshi was among the finest Japanese artists of his age, he was also a contemporary of the Impressionists, many of whom became inspired by ukiyo-e prints just as the genre began to decline in popularity in Japan. We are delighted to present the artist’s achievements in tandem with an in-depth exploration of Impressionism nearby in the Dorrance Special Exhibitions Galleries, to illuminate the various ways in which artists working at the same time in different parts of the world benefitted from a growing artistic exchange. 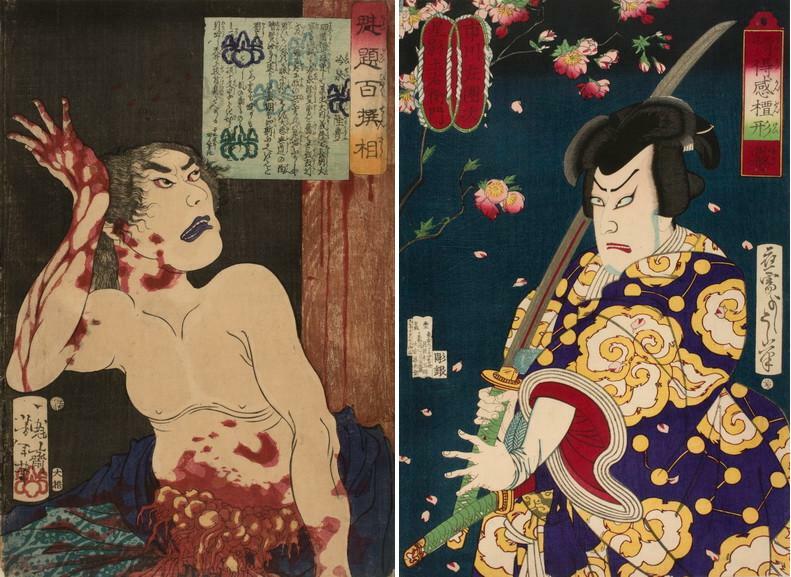 Left: Tsukioka Yoshitoshi – Reisei Hangan Takatoyo Dying of Disembowelment, from the series A Selection of One Hundred Warriors, 1866. Color woodcut. Sheet (ōban tate-e): approximately 15 1/2 × 10 1/2 inches. Gift of Sidney A. Tannenbaum, 1978 / Right: Tsukioka Yoshitoshi – Mist: Actor Ichikawa Sandaji as Hoshikage Tsuchiemon, from the series A Barometer of Emotions, 1876 . Color woodcut. Sheet (ōban tate-e): approximately 15 1/2 × 10 1/2 inches. Purchased with funds contributed by the E. Rhodes and Leona B. Carpenter Foundation, 1989. The examples of Tsukioka Yoshitoshi’s work from the 1860s made during his apprenticeship with the master Utagawa Kuniyoshi (1797-1861) will open the exhibition. 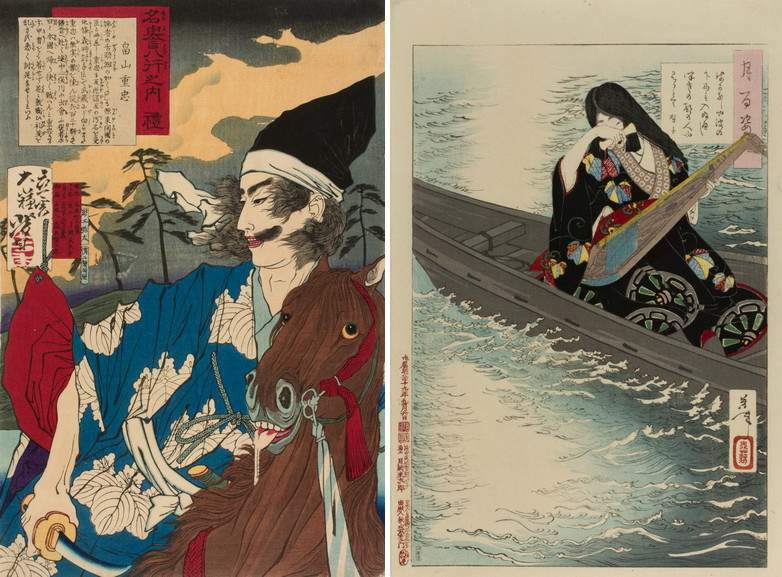 These prints show the artist’s explorations of the ukiyo-e printmaking, or pictures of the floating world, encompass various subjects from historic battles, over myths and ghost stories to the portraits of actors and are characterized by asymmetry of design, exaggerated foreshortening, and cropping of figures. The triptych General Masakiyo at Shinshū Castle during the Invasion of Korea in 1590, (1863) reflects the artist’s global awareness (the image of St. Paul’s Cathedral in the background refers to Japan’s battle with the Brits at Kagoshima the year the print was made). Yoshitoshi gained fame for his masterful depictions of violence seen in works such as Twenty-Eight Famous Murders with Verse, (1866-67), and One Hundred Warriors, (1868) made before he took a short break from printmaking which was caused by financial struggle and health complications. On display will also be the works made during the early 1870s in the midst of the rapid growth of the newspaper industry. Yoshitoshi was commissioned then as a print designer, and the series such as Beauties and Seven Daytime Flowers (1878), which presents beautiful women of the imperial court paired with flowers illustrate his developing style really well. In the mid to late 1800s the fires in Japan were often due to the increment of the population in wooden structures in the late Edo and early Meiji periods. The selection of Yoshitoshi’s prints (such as series Fireman’s Standards of All Great Districts (1876)) illustrating fires and firemen in Japanese everyday life are followed by objects such as a fireman’s coat and hood from the same period. By the early 1880s, Yoshitoshi established himself as a productive and even commercially successful artist who led an active studio with loyal apprentices. 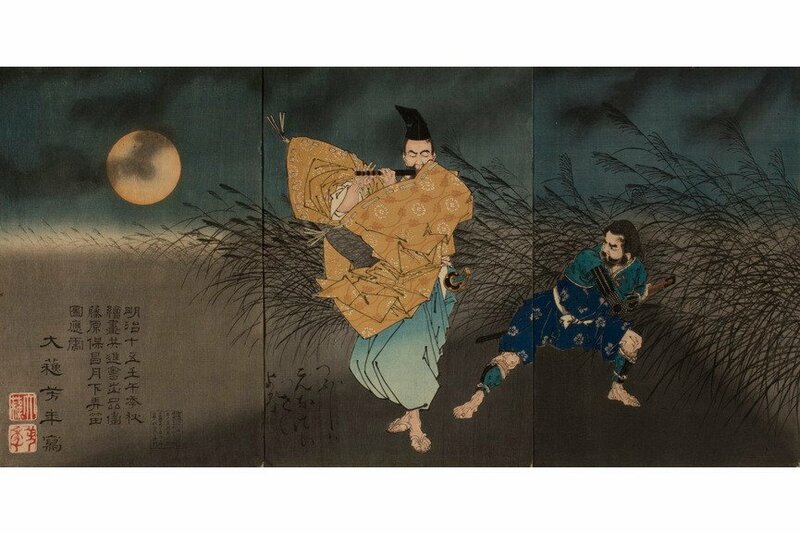 His best-known series One Hundred Aspects of the Moon (1885–92) which made him the most popular artist in Edo was released during that time; they encompass samurai, stoic warriors, everyday townspeople, poets, demons and geishas through stories related to the moon. Over the last ten or so years, there has been a new appreciation, a sort of revisionist history, of Yoshitoshi’s life and work. While he remains best known for his unforgettable scenes of gruesome violence, this exhibition demonstrates the range of his achievement as an innovative image maker. Yoshitoshi’s challenges were not so different from our own: he was a traditionalist who sought ways to advance the cultural heritage and distinctiveness of his native country within an increasingly transnational world. Spirit and Spectacle will be on display at The Philadelphia Museum of Art from 16 April until 18 August 2019. 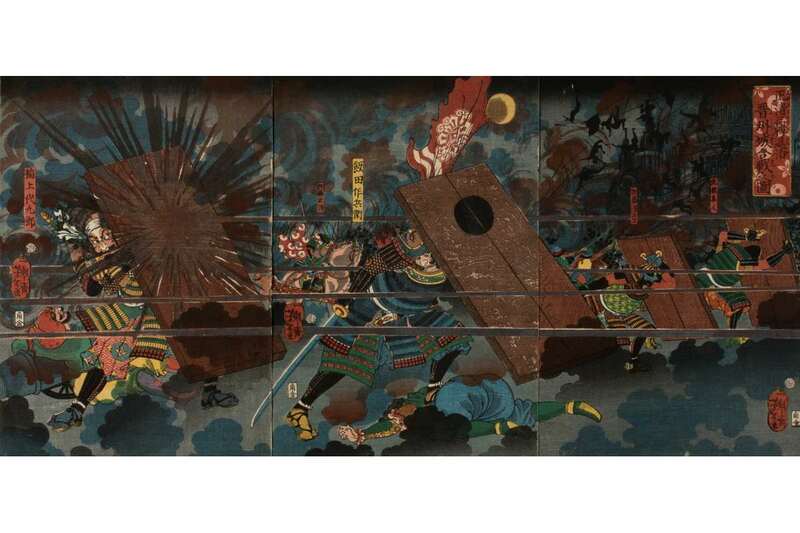 Featured images: Tsukioka Yoshitoshi – General Masakiyo at Shinshū Castle during the Invasion of Korea in the 1590s, 1863. Color woodcut on three panels. Overall: approximately 15 1/2 x 31 1/2 inches. Gift of Sidney A. Tannenbaum, 1978; The Twelfth-Century Warrior-Priest Benkei Attacking Young Yoshitsune for His Sword on the Gojo Bridge, 1881, Color woodcut on three panels (triptych). Mount: 15 1/4 x 29 7/8 inches; Sheet (3 joined printed panels): 14 1/4 x 28 3/8 inches. 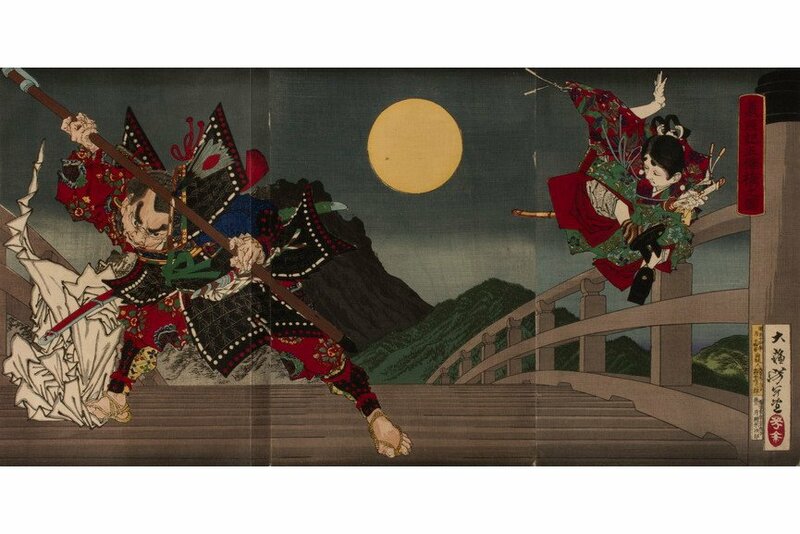 Purchased with funds contributed by the E. Rhodes and Leona B. Carpenter Foundation, 1989 ; The Heian Poet Yasumasa Playing the Flute by Moonlight, Subduing the Bandit Yasusuke with His Music, 1883. Color woodcut on three panels (triptych). Ōban triptych: 14 1/16 x 28 7/8 inches. Purchased with funds contributed by the E. Rhodes and Leona B. Carpenter Foundation, 1989. All images courtesy of Philadelphia Museum of Art, 2019.